A service dog backpack makes it possible for assistance canines to carry around items their person may need to help them get through their day. The variety of items carried in a pack could range from medical supplies to personal aids to smaller rescue tools and the dog's own water bottle. It all depends on the dog's occupation. However, the backpack must weigh no more than 18 pounds when fully loaded. This maximum limit keeps the dog from tiring quicker than need be, and also prevents excessive wear on his spine, shoulders and other joints. There's no hard rule that says your service dog has to wear a particular color, but it's nice to know if you want to abide by the tradition. Please Don't Pet, I'm Working! 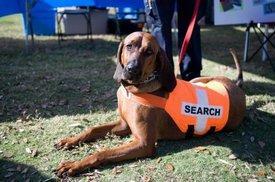 Patches help ensure that people don't approach the dog and disrupt his concentration on the job at hand. In many cases, this could lead to an accident. For example, a sight assistance dog needs his full concentration to guide his person across the street. He cannot respond to personal affection or he might accidentally lead into oncoming traffic. A search dog works mainly by scent, so smelling the hand of a well meaning visitor might throw him off the track. Most people quite understand about maintaining their distance once they realize the dog has an important job to do. The backpack pulls double duty in this regard. Service dog backpacks come in many styles. Here's a small sample of what is available. Saddle Bag™:Wolf Packs® makes this lightweight backpack for service dogs that don't need to carry a lot of gear, and dogs that work in tight spaces. It retails for $45.00. Reflector™ Dog Pack: Also from Wolf Packs®, this sturdy double saddlebag backpack is made from extra tough nylon fabric, and features reflective stripes to make your dog more visible during night work. It retails for $64.00. Banzai™: This is Wolf Packs® top model. It's made of the most durable nylon, and features reflective stripes and compression straps that keep the weight load distributed over the dog's shoulders- the strongest part of the back. 0 Working Dog Vest: Sold at ActiveDogs.com, this backpack comes with its own LED flashlight, detachable zippered bag and vinyl identification pocket. It retails for $148.99. 0 Search and Rescue Vest: Also from ActiveDogs.com, this combination service dog backpack and harness comes with a flashlight, reflective stripes, a swivel lead attachment and a carrying handle on the back. It retails for $89.99. It's important that your service dog's backpack fits correctly so there won't be any rubbing to cause sore spots. After all, he's likely to spend a good portion of his day wearing it, so you want to keep him as comfortable as possible.The best method of measuring is by running a fabric or vinyl tape measure around the dog's torso approximately 1/2 to 2/3 back from his front legs. This is about where the waist strap will rest. Be sure you are able to fit your finger between the tape and your dog's body so the fit doesn't wind up being too snug. If you don't have a tape measure you can substitute a length of string, cut it where the end meets and measure it with a ruler. The tape measure is usually more accurate since it doesn't stretch the way string does.